First the cooking situation. Some context… we sold our house a while ago and were in the process of moving out of state. We realized it was easier/cheaper to sell everything and keep only the essentials and replace big, bulky items once we relocated. This would also give us a chance to go down to the bare essentials and dial in the things we really needed. I had amassed a healthy set of cookware through my grandparents. High quality, long lasting cookware, the stuff you’d expect your grandmother to have and keep forever. The problem was I had all these obscure specialized things, like double-broilers, that I never used. I realized most of what I cooked was done in a skillet or pot. 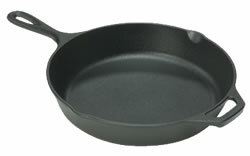 I had a few nice teflon skillets that were in various states of leeching evil into my food. I realized quickly those weren’t worth keeping and that I had 2 sizes of pots that I used regularly so those were keepers. They nested nicely into a larger post which is good for soups and pasta, so easy justification to keep that one. The skillets were the problem though, I never had the patience to learn to cook properly in a non-coated pan, but I really liked the concept of a cast-iron skillet. Simple, effective, timeless and reliable. I knew if I could figure it out, I’d have a piece of cookware I could keep forever. Just like my grandmother would’ve done. I ditched the teflon pans and bought a large cast-iron skillet. Problem solved, through simplicity and reverting back to the time-tested basics. It’s worked out great and a year later my skillet is nicely seasoned. Now for my surfboard, the antithesis to the cast-iron skillet. First, context. I had always gotten poly boards glassed with 6/6/6 glassjobs because I was conscious of durability. I started wanting lighter boards but wasn’t willing to give up durability, so I settled on stringerless epoxy boards. Good solution, it worked out well for my needs – lightweight, durable and performed really well. With surfboards, there’s always some tradeoff. When you talk about increased durability, you are usually sacrificing lightness. With poly boards, the trick was to go to lighter blanks and lighter glassing. We all know how this ends. Disposable boards, that ride well for a really short time before they start falling apart. You start getting into EPS blanks and you can go lighter on the blank and make up for it with more glass. So you end up with a board that weighs the same, maybe a little less than a poly equivalent but is noticeably stronger and quite a bit more durable/long-lasting. Following logically down that path, you start removing bits, namely the heavy wooden stringer. Again, more glass to compensate, now you have an even lighter board that is just as strong. At some point you start getting diminishing returns with super-light EPS. At EPS blanks around 1# EPS you start getting into problems that more glass alone won’t solve. The foam is just too spongy to support the forces encountered while surfing without adding so much glass to make it uncomfortably stiff. So what’s next? Even lighter foam, but putting a skin on top of it to support the surfing loads then strategically adding glass where it’s going to provide the most benefit. Turning to technology to solve problems that arise such as carbon on the rails to provide the structural rigidity and flex since you’ve ditched the wooden stringer and gone with a super-light core. Putting the whole lot into a vacuum bag to optimizes the cloth/resin ratio, which has the added benefit of decreasing weight and increasing the strength over a hand-layup. That’s the point I’m at with now. I’m really happy with a 5 pound board that’s been abused for 2 years and hardly shows any signs of wear. It’s been a years-long process of evolving through boards, but I’ve ridden all the different construction methods and learned firsthand their strengths and weaknesses and know that where I’m at now is a really good place to be. Cast iron vs. carbon fiber, two totally different approaches to similar problems. One solved by going backwards technologically, the other solved by pushing up on the boundaries of what’s possible with the given materials. This isn’t to say this is the right solution for everyone, but illustrates the point that the solutions to a problem are a matter of perspective. I could have easily flipped the solutions and gone with a super high-tech skillet and gone back to a chambered balsa board to solve my durability issues. That’s not where I wanted to go with either solution though, my context was different from what yours may be. Someone else’s solution may not be your solution. Figure out your context and solve your problem accordingly. great article and great to think about. just discovered your site too…thanks.